Product code: ES1079 Categories: Sold Items, Sold Rings. This ring is so attractive and beautiful and is one that is so elegant and typical of the work from the early 1900’s. Made in 18ct gold, it is set with sapphires and diamonds in a stunning design. 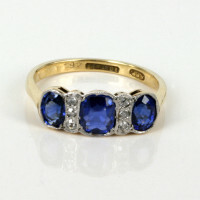 Set with 3 main diamonds with a further 10 around the outside, the sapphires give a great contrast in colours. There are a mix of sapphire cuts which really make this ring unique – a mixture of 6 round sapphires, and 16 square cut sapphires which will have you admiring the ring for hours on end. A beautiful ring for any occasion, including as a great antique engagement ring.